What can one say about The Bookshop, a movie that stars Emily Mortimer, and cinematic treasures co-stars Bill Nighy and Patricia Clarkson? It’s a bit like PBS version of a superhero movie…The Bookshop is directed by Isabel Coixet, who wrote the screenplay from the classic 60s novel by Penelope Fitzgerald. In 1959 England, widow Florence Green (Emily Mortimer) puts all her money, time, and passion to opening and operating a small bookshop in a very conservative coastal town. She attempts to brings about a cultural awakening in carrying books by the likes of Ray Bradbury and Vladimir Nabokov. Unfortunately, she comes under the scrutiny of local grand dame and town bully Violet Gamart (Clarkson), who decides she must have the abandoned, leaking mansion Florence is lovingly restoring for her own purposes. 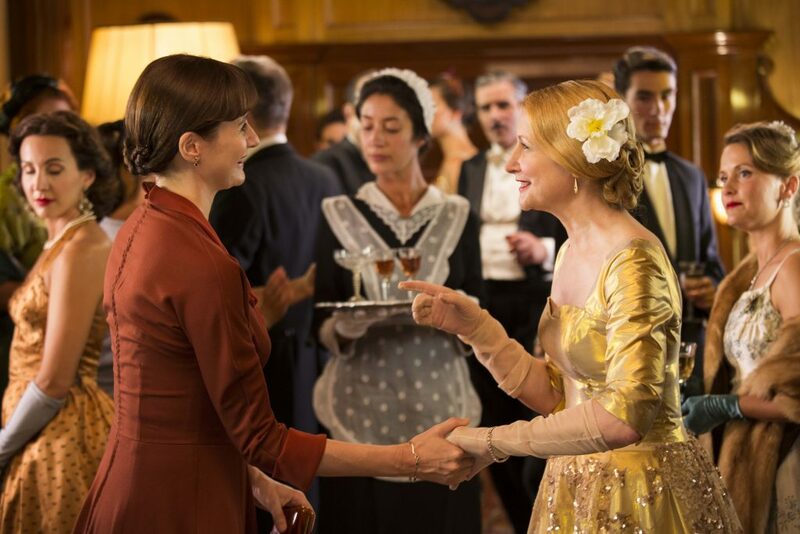 Violet, jealous of Florence’s gumption and quiet determination, begins a campaign to get Florence to abandon her dream and relinquish the house. Florence finds an unlikely ally in reclusive book lover Edmund Brundish (Nighy), who supports her efforts through purchases and an offer of friendship. Can those who threaten to unravel the plans of a quiet, resolved dreamer be stopped? Florence soldiers on even in the face of repeated warnings. There is also a strong feminist element to the story, in that she has a vision of something more for her town, and she believes she can create it. For her, being a woman is just not part of the equation and should have no bearing on whether the minds in this small town can be expanded. It needn’t be a man offering this expansion. Whether she wins the war against the narrow-minded, inflexible elements in her town doesn’t really matter, if she can show that standing up for change, and for personal vision, is a soul’s most worthwhile endeavor. Beyond the glorious production design and spectacular costumes, seeing Mortimer interact with both Bill Nighy and Patricia Clarkson is a delight, even as the exchanges are alternately caustic or excruciatingly awkward. There is one scene in particular, between each pair, that perfectly represents gracious thespians giving each other room for expression and reading each other moment to moment. Clarkson can be terrifying behind her carefully applied bright red lipstick, and with Brundish Nighy serves up the sort of fractured spirit searching for connection that is both compelling and heartbreaking. Movies that come to the big screen that are not about folks in tights fighting to save the world are few and far between. The Bookshop is one, and the main character is, in her way, as much a heroine as any in the DC or Marvel oeuvre. She is just a grieving woman who will do whatever it takes to find joy in life again, and stands up for her dreams. There’s nothing more heroic than that.